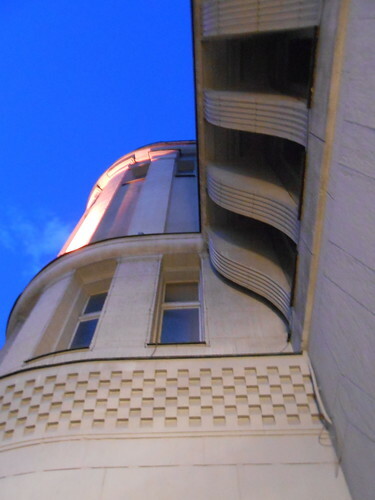 This saturday night i had booked a literary nightwalk through my neighbourhood Schöneberg via the Theatergemeinde. It was themed “Life was a Cabaret?” and showed places around the Nollendorfplatz were many artists and authors lived in the 1920’s. 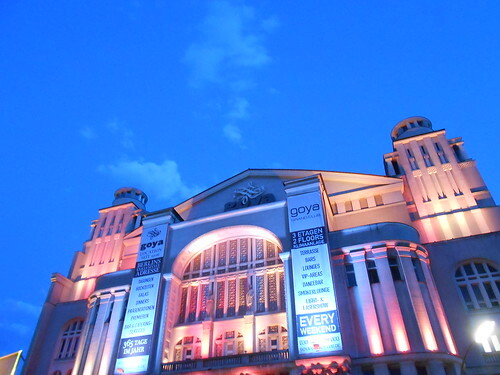 – today’s nightclub Goya used to be a 1800 seats theater called Piscator-Bühne in the 1920’s. The theater itself does not exist anymore, what you see today was the cinema located in the same building. – Schöneberg was a city of its own until 1920 when Berlin, Charlottenburg and Schöneberg were merged to Berlin. – Nelly Sachs ( Nobel Prize winner of 1966 ) was born in the Maaßenstraße. – Christopher Isherwood lived several years in the Motzstraße 17. The musical and film “Cabaret” is based on one of his novels written in Berlin. – Marlene Dietrich was a frequent guest of the nightclub Eldorado which does not exist anymore, the location is now a bio-supermarket. – Else Lasker-Schüler lived for years in a hotel on Motzstraße. – A scene of Erich Kästner’s “Emil und die Detektive” takes place right here at Motzstraße and the Piscator-Bühne. We walked for about 2 hours, the walk wasn’t very long in terms of distance. At every stop the guide would explain the historical context and read some excerpts of an author who described this particular place or circumstance. It was interesting to learn about the sub-culture of this area in the pre-WWII era, what kind of reason many of these artists and intellectuals had to be there ( for example, this area used to be the gay-quarter, and it still is today ). The tour was organized by StattReisen, who offer a big and very interesting variety of themed city-walks. Highly recommended if you want to see Berlin through a different angle. I’ll definitely do some more in the future!